The Congressional Budget Office (CBO) has released their estimate of the economic impact of the President’s 2013 budget. It’s not good. It’s not even good relative to Taxmageddon, which is the roughly $500 billion tax increase scheduled to happen at the end of this year due to expiring provisions such as the Bush tax cuts, the payroll tax holiday, and the Alternative Minimum Tax (AMT) patch. Taxmageddon is what the CBO calls their Baseline scenario, because it is current law. “CBO estimates that the President’s budgetary proposals would boost overall output initially but reduce it in later years. For the 2013-2017 period, under most of the estimates CBO produced using alternative models and assumptions, the President’s proposals would increase real (inflation-adjusted) output (relative to that under current law) primarily because taxes would be lower than those under current law, and, therefore, people’s disposable income and their demand for goods and services would be greater. Over time, however, the proposals would reduce real output (relative to that under current law) because the deficits would exceed those projected under current law, and the effects of increasing government debt would more than offset the favorable effects of lower marginal tax rates on labor income. 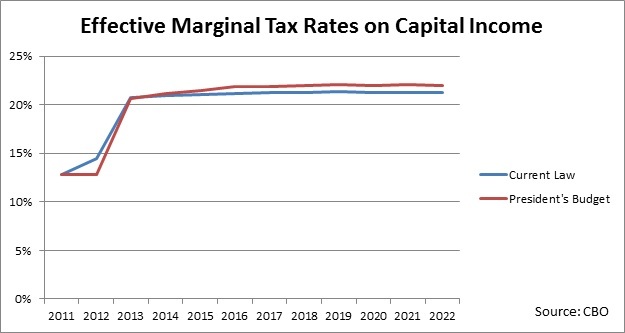 Below are two graphs showing the CBO’s projection of effective tax rates on capital and labor under the two scenarios. Both scenarios are horrible, but the President’s budget makes things a little more horrible for investors and a little less horrible for workers, i.e. relative to Taxmageddon. 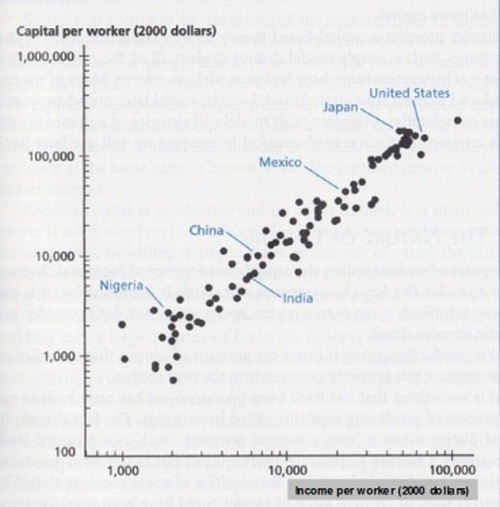 However, the third graph, taken from Steve Landsburg’s blog and David Weil’s text book on economic growth, illustrates that capital and labor are closely linked. This is physical capital, such as computers and buildings. The graph clearly shows that high wages require high capital investment. Think of trying to do what you do with a typewriter rather than a computer. As we can see, the game of short term stimulus at the expense of long term investment is one that ultimately hurts workers.